I’ve been promising various people I’d do this for ages, and now I’ve finally started to get it together. 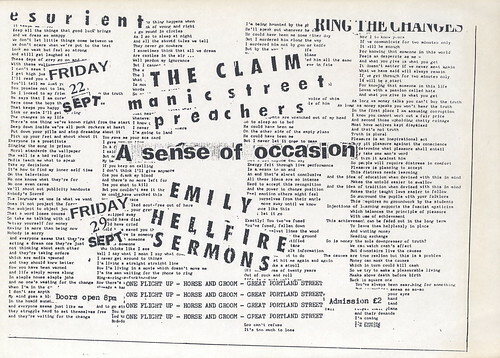 So here, in the first of a short series, are the recordings of Emily and Hellfire Sermons live at The Horse and Groom on Great Portland Street, London, on September 29th 1989. Catch the Emily set here, and the Hellfire Sermons one here. Many thanks for posting this, you’ve made me very happy tonight! Sorry to have bugged you for so long. Thank you! The second song is Rachel and the last three are Merri Go Round, Boxing Day Blues and Stumble, but can anyone identify any track 1, 3 or 4? in the Emily set I mean.